With all the latest information we have on the nutritional value of different fruits and vegetables, salads have become more than just a dinner salad. With the introduction of vegetables that include leafy greens and root vegetables, like black radishes, endive, kale, arugula, purple, white, and yellow carrots, just to name a few, and with an array of different fruits as well, like figs and pomegranates. They have always existed, but not common to the produce section, as in recent years. If anyone can remember, kale always adorned a salad buffet bar, but was never part of the salad you would put on your plate. As we mentioned at the on set of the article, salads have become more than just a dinner salad, they have now become a Main Dish Salad. 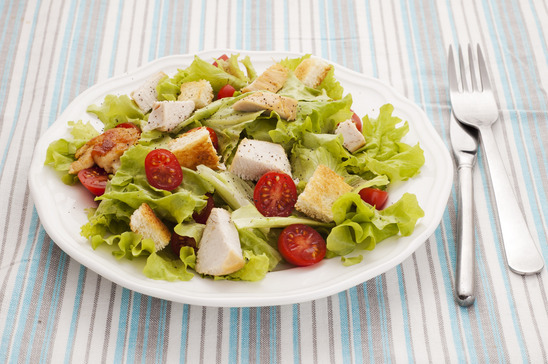 Sure there has always been a Caesar Salad, and if you asked, they added chicken. But now there are a lot more dressed up salads, than just a Caesar Salad. To make Main Dish Salads, does require planning ahead to make sure you have all of the nutritious ingredients. This means working out a meal plan for the week, prepping, shopping, stocking your pantry, and cooking. It isn’t as hard as it sounds. Sunday morning with your coffee, tea, or juice in hand, think what you and your family want for dinner the coming week. Once you have thought it out, make a list of the leafy greens, fruits and vegetables you will need, as well as the meat you want to top or mix into the Main Dish Salad. Having a main dish salad is both healthy and time saving as they are prepared with vegetables and require little cooking and prep time. A main dish salad can be prepared to reflect the season (though with world trade, most produce is available year round). Such as preparing main dish salads with produce that is naturally harvested in Spring (like beets, fava, leeks, herbs, peas etc. ), Summer (like bell peppers, berries, corn, eggplant, peaches, zucchini and other summer squash etc. ), Autumn (like cabbage, apples, figs, pears, broccoli, sweet potatoes etc. ), and Winter (like endive, watercress, celery root, fennel, citrus, winter squash etc.). As for the meat, use shredded rotisserie chicken, cooked chicken breast, breaded chicken, tuna, cooked beef, turkey, turkey ham, and pork ham. Include some cheese like goat, feta, Romano etc., and croutons if you wish. Once you find the salad recipes you like, you can use the ingredients to create your own combinations of a Main Dish Salad. This entry was posted in Salads as a Main Course and tagged Alternative medicine, Barbecue, Caesar salad, Cheese, Chicken salad, Cocktail, Coconut oil, Cut-up technique, Fruits and Vegetables, Main Dish Salads, rotisserie chicken. Bookmark the permalink. Thanks Jovina. Hope you enjoy your time with your family and friends this week.